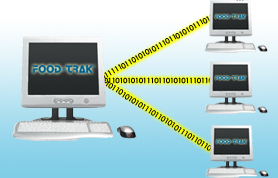 The Broadcast Module is designed for use by FOOD-TRAK® clients with multi-site environments. One of the cornerstones of SCI’s enterprise approach, Broadcast allows clients enormous flexibility to update individual sites or groups of sites with new items, recipes, input forms, and many other database elements of the FOOD-TRAK® system. Using an existing site or corporate model site, corporate users can select database elements to send to other sites as needed. Adding new raw materials, recipes and products is very simple and quick. Making modifications to existing items is a simple matter. The Broadcast Module allows two-way flow of data from site to site, and has very sophisticated approaches to selecting items and fields within those items for broadcast. Grouping functions make mass broadcasting routine, allowing clients to define regions, concepts and any other meaningful categorization of sites for one-button downloading of pertinent data. Clients with centralized systems can update multiple sites through the Broadcast Module simultaneously and clients with distributed systems can easily transmit the data in pre-formatted files which are automatically recognized by local FOOD-TRAK® systems and imported upon arrival.